Beautiful, simple and timeless in design, Merci Maman's chalcedony necklace is hung on an 18-inch sterling silver chain. 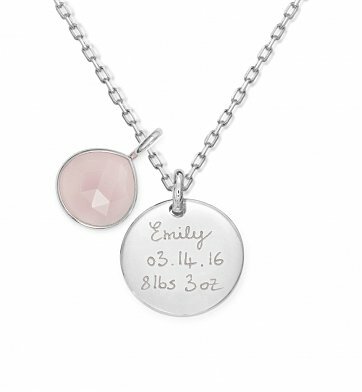 Names, dates or your personal message is engraved on the disc pendant French cursive style, along with a blue or rose chalcedony charm. One Sterling Silver 18" Chain with Hand-Engraved Pendant. One Chalcedony Gemstone Charm in Blue or Rose Color. Free Engraving! Up to 30 characters can be engraved on the pendant surface. Enter information to be engraved using the personalization option during checkout. Pendant Measures 1" in Diameter. Chalcedony Engraved Necklace is a hand delivered gift. These gifts are delivered by one of our local design centers located throughout the United States and Canada. Same day delivery is available for most gifts when ordered before the cutoff time. The cutoff time for Chalcedony Engraved Necklace is in the recipient's time zone.